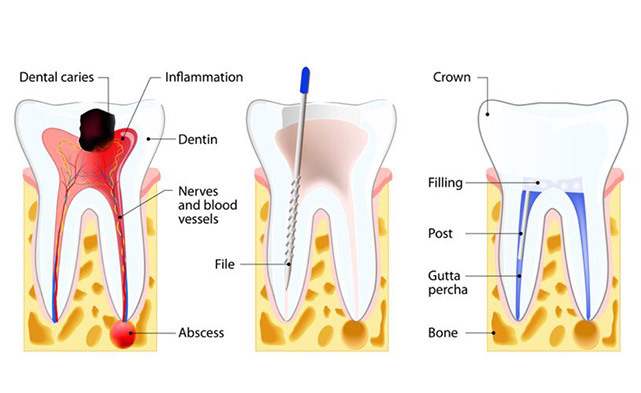 The aim of the treatment is to remove all the infection from the root canal. The root is then cleaned and filled to prevent any further infection. 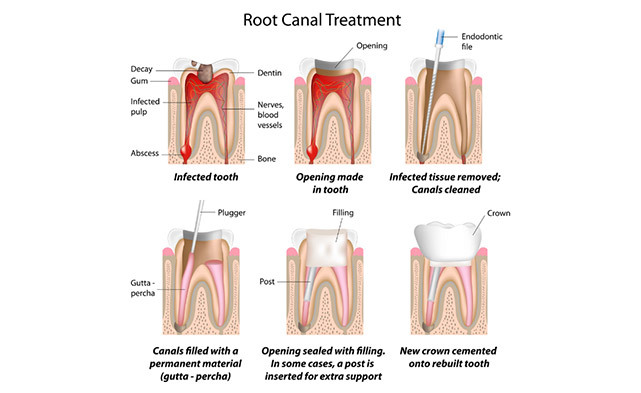 Root canal treatment is a skilled and time-consuming procedure. Most courses of treatment will involve two or more visits to your dentist. Root canal treatment is usually a routine dental procedure, which your dentist will be happy to do for you. However, sometimes if your dentist is unable to treat the tooth because of curved or blocked roots, we may refer you to an endodontist, who is a specialist in this type of treatment. Usually a ‘dead' tooth is more brittle, you may need to have a crown to provide extra support and strength to the tooth. Root-treated teeth should be looked after just the same as any other tooth. Remember to clean your teeth last thing at night and at least one other time during the day, with a fluoride toothpaste. Cut down on sugary foods and drinks, and have them only at mealtimes if possible.